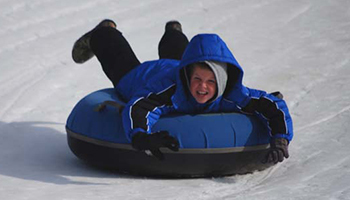 Better than than traditional sledding, snow tubing is great fun for the whole family. Slide down the run then take a “magic carpet” lift back to the top to repeat the fun. The Tube Run also features snow making capability and a lighted hill for nighttime fun. Featuring one big slope 60 feet wide at the top, 100 feet wide at the bottom and 350 feet long of sliding fun! No designated lanes means tubers have the option to link up tubes increasing the fun factor. In case you get hungry while having fun, we have snack and drink options available. Nothing better than cup of hot cocoa to warm up with! Located just outside Wolf Ridge Ski Resort at 3461 Puncheon Fork Rd. Click here for directions. Click here to download a waiver. Home School Specials Monday – Thursday. Call 828-689-3322 for more information. Great Fun! The whole family had a blast! We are currently closed for the 2018-2019 season! See you in December! Children 5 and under ride free with paying adult. A great way to celebrate your birthday! Call us to book your party.